How would you like to be required by law to visit your elderly parents? That could soon be the case in China, where they are discussing requiring children to "often visit" or "send respects to" aging parents. Does sending flowers on holidays count? According to state television, 33 percent of people in a recent survey said they visit their parents just once a year, and 12 percent said they hadn't seen them "in many years." 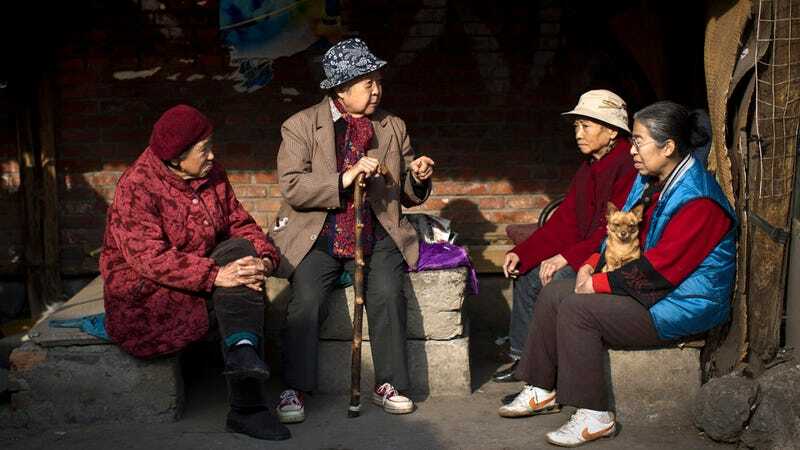 Still, 16 percent said they visited their parents once a week, but people in China are reportedly ashamed with the results of this survey, as the country prides itself on taking care of its elderly. People there are already legally obligated to care for their aging parents, but the discussion about whether they should be required to visit is new. It seems that many people have been forced to migrate to find work and once away they often don't have the time or paid vacations to be able to return home to see their parents. But more than just visiting, there's a clause in the proposed law that says it would be illegal to "neglect or cold-shoulder elderly people." Wow, talk about being vague and unenforceable—though kind of nice, in theory. Whether this is a good idea is the subject of great debate in China, but it remains to be seen whether they'll actually make it into law.